Shah & Co. offers you two types of softy ice cream machines that include single flavour-compact (SFC) and double flavour-table top (TT-DF). Our softy ice cream machine comes with tropicalised refrigeration components and is easy to maintain. 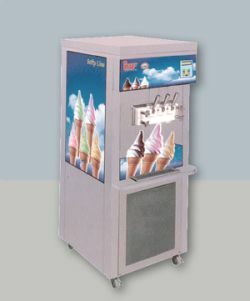 We proffer softy ice cream machine at the least market prices. Only 1 flavour like Chocolate or Vanilla or Strawberry can be made at one time. Single stainless steel cylinder with special designed beater for high quality output. Features like 'Stop', 'Production' and 'Clean' are manually controlled. Tropicalised refrigeration components- air cooled. Ice-cream consistency is manually controlled. 2 Flavours can be served simultaneously from one machine.